Welcome to our December 2018 Markers and Embellishments Release Blog Hop! If you have hopped over from Nathalie DeSousa‘s blog then you are right on track. You can start the hop over on the Altenew Card Blog. Today’s release is such a fun release, especially for scrapbookers. Embellishments are a key element in scrapbooking and having a choice of fun elements makes the creating part so much easier. My favorite elements are butterflies and flowers and boy, did I get spoiled with this release! The new Artist Markers make the release even more fun and offer lots of possibilities. For my first project, I created a 12 by 12 layout using lots of the new acetate pieces from the Butterfly Acetate Die Cuts pack. I paired them with some Watercolor Butterfly Cardstock Stickers and a wood veneer word from the Sweet Hearts Adhesive Wood Veneers. Take some white 8.5″ by 11″ cardstock and layer the photo and some patterned paper. I used a 6″ by 6″ paper from the Celebrate You Card Kit. Place a row of acetate elements and layer the Leaf Cover Die below. I colored it using some yellow tinted Artist Markers. Place a wood veneer as a title on top of the row of acetate circles. You can color them using the Artist Markers or add some sparkle using embossing powder. One of the large butterflies from the Watercolor Butterfly Cardstock Stickers adds a bit of detail and draws the eye towards the photo. Limited time only! Receive a FREE brand new Darling Lily Stamp Set (value $9.99) when you purchase select sets and bundles from our December 2018 Release! Offer valid from 12/6/2018 at 12:01 am EST through 12/8/2018 at 11:59 pm EST. The free gift will be added to cart automatically. Not valid on previous orders. While supplies last. To celebrate this release, Altenew is giving away a $50 gift certificate to 6 lucky winners! 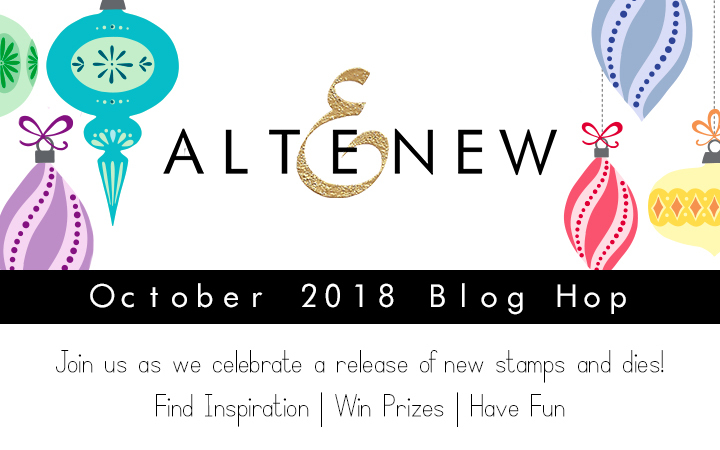 Please leave a comment on the here on the Altenew Scrapbook Blog and/or the Altenew Card Blog by 12/11/2018 for a chance to win. SIX winners will be announced on both blogs, three on the Card Blog and three on the Scrapbook blog, on 12/14/2018. Aren’t the new products FABULOUS? What is your favorite? Leave a comment below and then you can hop over to Zsoka Marko‘s blog. Wonderful release! Was just making a card using Altenew inks & stamps & thinking, “I wish I had matching enamel dots to finish off this card!” And voila! Love the beautiful layout! Beautiful release!! The flowers, markers and embellishments are so inspiring! Thanks so much!! This is such a beautiful way to embellish your layouts and I really like the combination of acetate butterflies and wooden word. I am wondering though, how you adhere the butterflies so that the adhesive doesn’t show through. Beautiful layout. I love the coloured die cut, and the beautiful blues in the backdrop. Yay for more marker colors! And what beautiful butterflies! Love the gorgeous colors and your use of embellishments on your layout. Thanks for sharing! Great design on your layout. Love all the elements. The butterflies are gorgeous!! I love that idea, using mostly butterflies for a collage looking background. Love the bright blue/green/yellow of this layout. So many happy spring/summer colors, which is a nice break from all the Christmas and winter cards recently. This gave me a smile. Love the new release. Especially the embellishments bundle. I will definitely have to have that. What a beautiful layout with all the layers! I absolutely love this release! Can’t wait to add the markers to my collection and I’m so excited about all the stickers, die cuts and enamel dots! I will be able to use all of these supplies on my cards and scrapbook pages! Absolutely loving the inspiration in this blog post – the colours are fantastic, and along the hop! Can’t wait to treat myself to the markers and the fab enamel dots! Beautiful layout. I would love to get some of those alcohol markers. Thanks! The Altenew release is fabulous. I love the scrapbook layout using butterfly stickers from this release. The colors are bright and cheery and the little boy is adorable. Thanks for the inspiration. Such pretty layouts! Thanks for the inspiration! Sweet, fun page. I love the layout and the blues are gorgeous. Awesome page! Loving the acetate butterflies, and the die cuts! Such great new items. Such a happy layout! Love the blues and pop of yellow with that stunning butterfly sticker! Beautiful layout! Love the colours! Really pretty page, love the colors and embellishments. Super fun and beautiful layout! Fabulous new products. love the butterflies. So Pretty. your layout is great! thanks for sharing your inspiration. Fabulous release! Love the butterflies & the marker colors & the dots!! Awesome projects!!! Love the great color combos…such fabulous inspiration! LOVE the design, colour combo and VIBRANT colours! So butterlys can be masculine : what a great idea ! luv the colors of this layout!! How gorgeous!! Love the bold color combo! Beautiful layout! The embellishments are lovely! Love the butterfly and the wood veneers! Love the new enamel dots! Very beautiful and creative indeed! Thank you for taking the time to share! Right now, I can only find altenewscrapbook.com on text search after digging a few pages (that’s hurting your business), competitors above are getting all the traffic and business! Lilith you can’t imagine how much I adore these gorgeous butterflies! and how you’ve used them – I hope this little guy grows up to love them, too! Just splendid! Totally beautiful. The colours are just so adorable.